The current special exhibit at Cathedral Museum is entitled “Vessels of Veneration” and gives visitors a chance to view up close some of the oldest and perhaps most ornate monstrances in Fort Wayne. 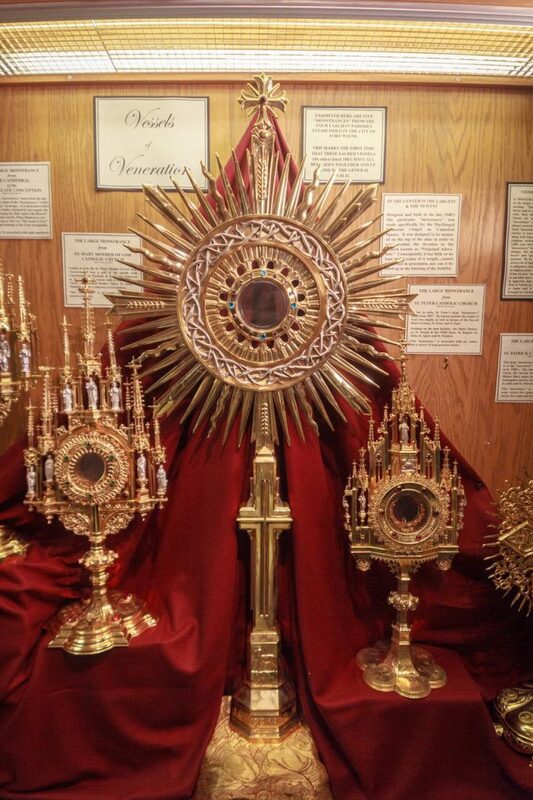 A monstrance is used to enshrine and expose the consecrated eucharistic host, the true Body of Christ, for adoration. Each of the five on display are on loan from a different Fort Wayne parish. 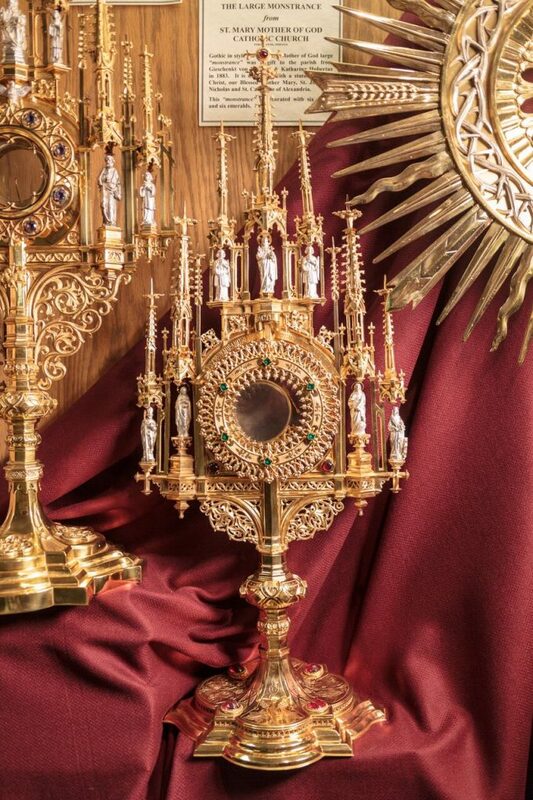 Appropriately, given the dignity of its content, each gold-plated monstrance is truly a sight to behold, with its intricate designs, precious gems, beautiful statuettes and a cross at its highest point. “People don’t usually get to see them up close. This is a chance to see them in a more close manner and get an idea what they’re all about,” the Cathedral Museum’s director, Father Philip Widmann, said. 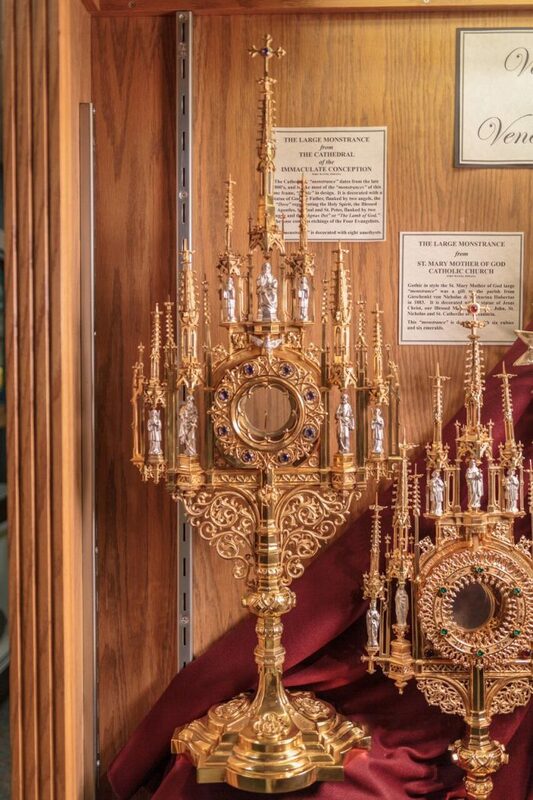 A Gothic-style monstrance on loan from St. Peter Parish, Fort Wayne, dates to 1897. The monstrance from St. Patrick Parish, Fort Wayne, dates to the early 1900s and has a sunburst design. The largest monstrance in the exhibit, from MacDougal Chapel, now the St. Mother Theodore Guerin Chapel in Fort Wayne, stands about 4 feet tall. Rubies and emeralds decorate a monstrance on loan from St. Mary, Mother of God Parish, Fort Wayne. 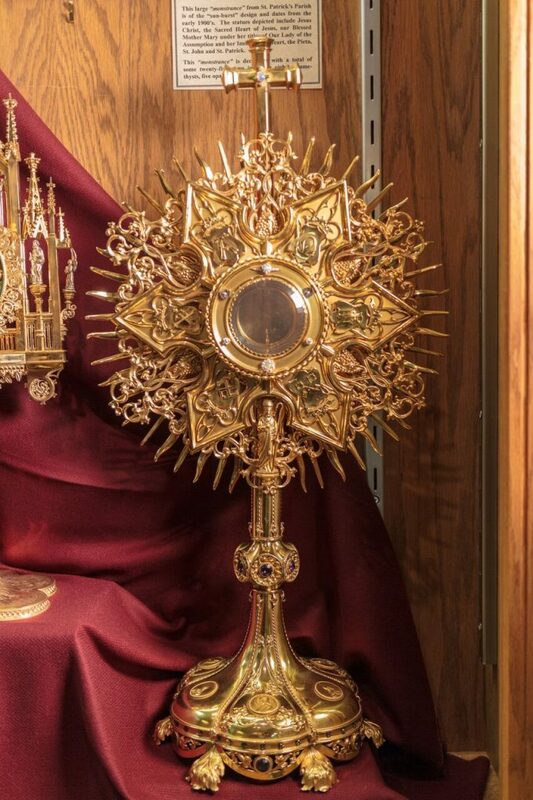 It is the oldest monstrance in the collection, dating back to 1883. The exhibit was unveiled in the summer, and this is the first time they have all been seen together. Father Widmann organizes a special exhibit for the museum every year. The oldest monstrance in the collection dates back to 1883 and is on loan from St. Mary, Mother of God Parish, where Father Widmann also serves as pastor. It contains statuettes of Jesus Christ, our Blessed Mother and various saints, as well as six rubies and six emeralds. 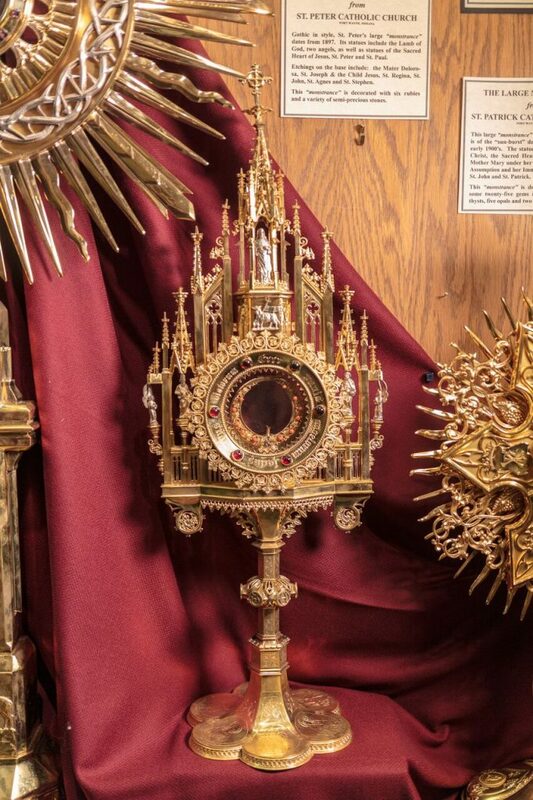 The largest monstrance stands about 4 feet tall and is also the newest in the exhibit, dating to the late 1940s. It was designed specifically for MacDougal Memorial Chapel, now the St. Mother Theodore Guerin Chapel, for perpetual adoration of the Blessed Sacrament. Consequently, according to Father Widmann, the monstrance was mounted on top of the altar and does not have much of a base. Due to its weight, it cannot be carried in a procession or lifted up in Benediction — a blessing using the exposed Eucharist contained in the monstrance. Eight amethysts decorate the Gothic-style monstrance on loan from Fort Wayne’s Cathedral of the Immaculate Conception. Designed in the late 1800s, there are many meticulous statuettes, including a montage towards its top of God the Father, with an angel on either side; and below, a dove representing the Holy Spirit. Another Gothic-style monstrance, designed in 1897, comes from St. Peter Parish. Decorated with six rubies, it contains statuettes of St. Peter and the Sacred Heart of Jesus. On its base, there are etchings of the Mater Dolorosa, St. Joseph and the Child Jesus, and other saints. The monstrance on loan from St. Patrick Parish has a sunburst, rather than a Gothic design. 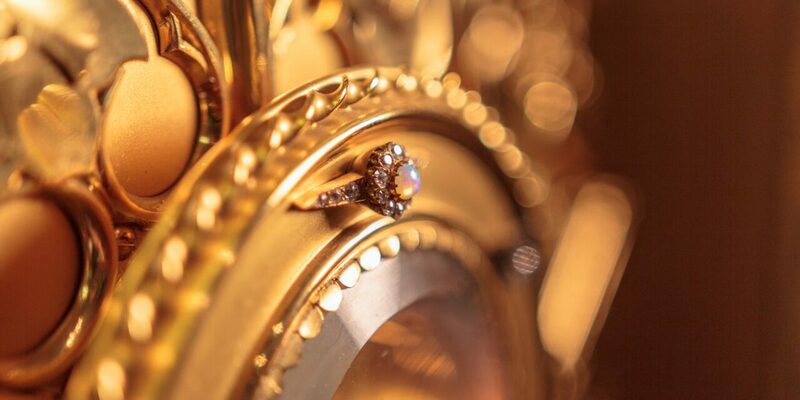 Dating back to the early 1900s, there are statuettes of Jesus Christ, our Blessed Mother and St. Patrick, and about 25 gems, including amethysts, opals and diamonds. Cathedral Museum is located in the Archbishop Noll Catholic Center’s lower level. Admission and parking are free. The museum is open Tuesdays through Fridays from 10 a.m. to 2 p.m. 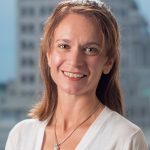 The Vessels of Veneration exhibit will be on display through June.